In 2017 I scored my first video project. I found that I really enjoy both editing video and scoring video. The newest of my creative interests, I’m looking forward to expanding my experience in this arena. The loneliness one feels in one’s own body will drive connection just as much as it will repel it. When stillness becomes inertia, our own weight exacerbates. We see ourselves through a lens of our own making. My first video installation piece, Gravity Well was part of the larger work ReShape - a collaborative immersive installation investigating the mental landscape. A screen was constructed out of crumpled bogus paper, and a 45 minute video of a body in isolation was projected. 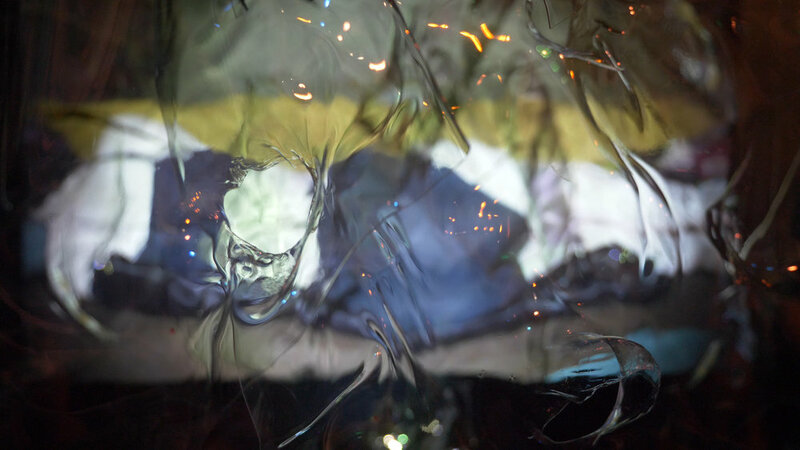 Only viewable through a gallery window, pieces of warped PNTG plastic swayed suspended from fishing line between the viewer and the screen, as well as directly in front of the projector lens. Dark Set Films creates short dance films on the dark sets of local theatre productions. They approached me to score this piece, as they wanted not traditional music, but a haunting, sharp, industrial soundscape. This piece titled Mares was filmed on the set of Scary Mary and the Nightmares Nine, designed by Eddie DeHais. Choreographed by Emily Durand, filmed and edited by Brett Love. Teaser promo video conceptualized and edited by myself. Footage shot by Zane Exactly, Michael B. Maine, Nick Spencer, Eddie DeHais, Nicholas JaPaul Bernard, and myself. Full documentary-style video showcasing ReShape. Created in collaboration with Craig Amromin. A visit to the county fair with a dear friend and the slow motion setting on my iPhone lead to this..